Tickets for Roy Arbuckle’s long-awaited ‘The Fountain: a musical play,’ are now available with rehearsals currently underway in the Memorial Hall, Society Street, where the new work will premier at the end of next month. Directed by Michael Nangle, choreographed by Nadine Sweeney with musical arrangements by Tom Newman and Roy Arbuckle, the new work tells the story of The Fountain, the sixties, seventies, rock n’roll, young love, lost love and emigration. Robbie returns home. Has everything changed? Will he find the life and love he left behind? It plays over November 25, 26 27 28, in the Memorial Hall, Society Street. Tickets are available now from the Millennium Forum. 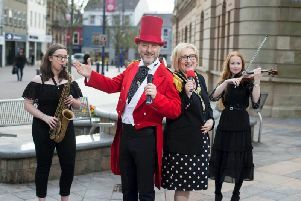 “The Fountain a musical play” is supported by the Arts Council of Northern Ireland, OFMDFM, Derry City and Strabane District Council, the Siege Museum, ABOD, the Inner City Trust and Towards Understanding and Healing. Sponsors include Maldron Hotel and Sandwich Company. Pictured are Annie McCarroll who plays Creggan woman Peggy and Ryan Johnston who plays Fountain resident Robbie.